Originally built in the 7th century, Shri Banashankari Shakti Peetham is a highly regarded temple in the state of Karnataka. What stands in front of you now is the refurbished temple that was built in 1750. The temple has derived the name Banashankari since it is situated amidst the Tilakaaranya forest. The temple has Dravidian style of architecture and is a piece of art. You are greeted by the tremendous deep stambha at the entrance of the temple that effectively inspires awe. It has an artificial pond right in front of it. 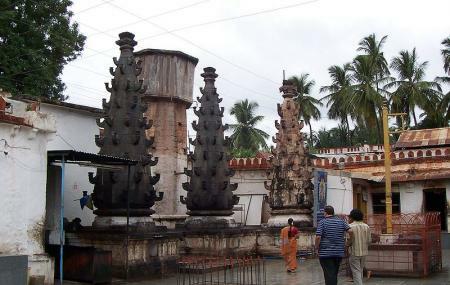 You will find inscriptions in Kannada script on a few pillars of the temple. Head towards this place to witness an age-old temple that has stood the test of time. Create a customized plan for your visit using the Badami trip planner. You can use ready templates or start from scratch for the same. You can add cozy hotels in Badami like Hotel Mayura Chalukya, Badami, Hotel Rajsangam International, Clarks Inn Badami and Hotel Badami Court. If you want to add the visit to Banashankari Temple in your trip, you can choose from the variety of Badami vacation packages that can be designed to suit your preferences. These packages also cover your major concern of how to reach Badami. Love this? Explore the entire list of places to visit in Badami before you plan your trip. Fancy a good night's sleep after a tiring day? Check out where to stay in Badami and book an accommodation of your choice. How popular is Banashankari Temple? People normally club together Badami Cave Temples and Lad Khan Temple while planning their visit to Banashankari Temple. Amazing place nearby to Badami. Temple is actively worshipped so you might find some crowd here if visited on critical days. No entry free . Near to temple there is a lamp tower which is great to see as well . One of the blissful place to go, very famous and lively goddess. Kuldevi to many families including mine. Every visit is blissful and rejuvenating. Devi will help you in all respects and her blessings will all the required power to overcome many difficulties. Go with your honest feelings and seek her blessings in any and every act or desire, you will certainly feel the difference. This is the main shakti peetha of goddess Banashankari. Very near to Badami. Just 5 minutes drive. Badami has many hotels for staying. March to June, will be very hot. Temperatures can reach up to 46 degree.. Very nice temple and lot of places to visit in and around badami. Recently they started Anna prasad which is very good and also clean and tidy. Very hot weather after March but good management by devasthana trust.